New Delhi: Socially Backward Adivasis are way ahead in conserving and protecting the environment; here are 5 things we can learn from them. Adivasis are unfortunately referred to as primitive beings. They are one of the few communities who has lived during every stage of Indian history. Adivasis or as the name translates in the Sanskrit language, “natural inhabitants” of India have been a relatively socially outcast community of Modern India. But we can surely learn a few tips from our Adivasi brothers and sisters to ensure a sustainable future for ourselves. If one thinks of these communities and the way they function, one might applaud the fact that they have been sustaining in the society despite all the hindrances for so long. And rightly so, because we can all learn a lot from them as a society. Here’s a list of five things that we believe we can learn from these communities to live sustainably. Adivasis have mostly resided within or around the periphery of jungles. This can be seen by their dominance in forest-covered areas of Central India. Adivasis do not live a resource-intensive life, hence they do not depend on mining for their needs. They consider the forest as their “mother” and it is often personified in the form of a goddess. One doesn’t have to go back many years to understand the bond between adivasis and nature. The most well-known example is that of the “Niyamgiri hills”. This place is home to the Dongria Kondh Adivasis who consider the hills called Niyam Dongar to be the abode of their divine god. Their habitat came into danger when Vedanta Aluminum Limited agreed to establish an aluminium refinery as a part of the industrial development in Odisha. Despite suspicions over the environmental impact of the project, the Supreme Court granted clearance to Vedanta in August 2008. The decision led to a mass movement by the Kondh community who marched into the streets of Bhubaneshwar. 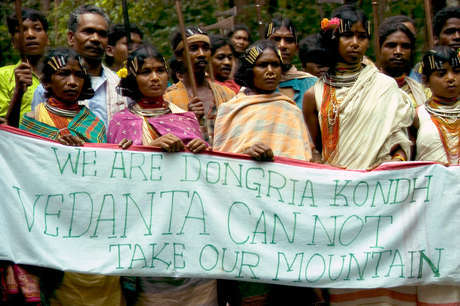 After a long struggle against the government, the Kondh community won the battle in 2010 when the potential environmental violations by the company were exposed. The community was successful in preserving their home and nature. Adivasis have been included in forest protection activities by state governments as well. This is the case with the Kokrebellur village of Karnataka where the state government defined roles for the local community to ensure reduction in bird poaching and encourage recreational activities to make the Kokrebellur bird sanctuary a tourist spot. Compare this to the current situation of deforestation, global warming, and animal extinction, Adivasis teach us the need to be in harmony with nature. Despite the introduction of modern techniques in agriculture, many states and farmers suffer from low productivity. And the ones that produce a sufficient quantity use a heavy dosage of fertilizers and pesticides doing little good to human health. The traditional farming methods of Adivasis have been successfully feeding their communities without the use of harmful substances. For example, Adivasi farmers in Dhaarav village of Madhya Pradesh practice the “utera” system. They save seeds from the previous harvest, sow several seeds at the same time, use animals to fertilise land and involve zero use of chemicals. In addition, mixed farming helps to recover the loss by failure of one crop. It would not be wrong to say that adivasis have a very diverse cuisine. They have food festivals of their own and showcase the variety of cooked and uncooked food collected from the forest. 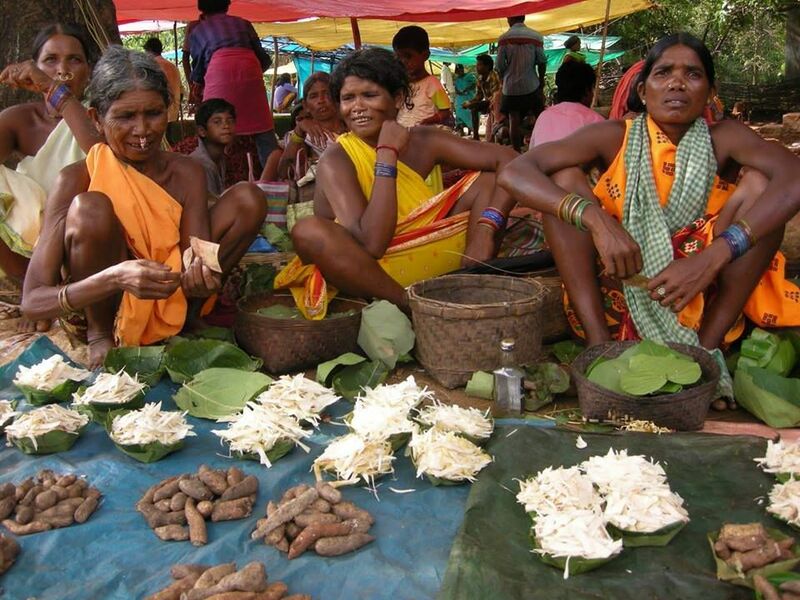 According to Vikalp Sangam, a food festival held in Cuttack in 2014 by Adivasis consisted of more than 1500 food varieties among which over 900 were uncultivated forest foods. 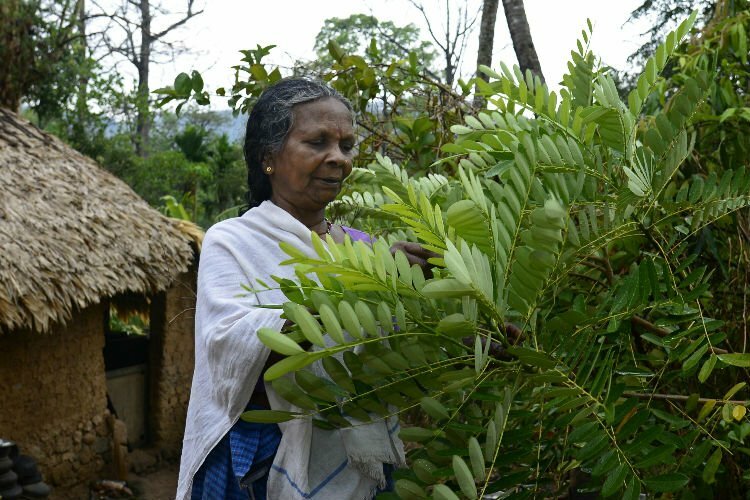 Adivasis still practise the ancestral act of foraging from forests. As much as 30% of their diet comes from the forest. In a world obsessed with processed foods that are packaged in plastic, Adivasis teach us how to have a diverse cuisine from readily available plants. We have a complex composition of different castes, sub-castes, cultures, religion etc. that form our social hierarchy. Needless to say, such bifurcations lead to conflicts among different groups of people resulting in mishaps. Perhaps we can learn a bit from the tribal culture on how to define identity. Collective identity of tribal people does not mean that they don’t have classifications; rather they have a different set of measures that dictate the structure of their societal composition. A tribal society is characterized by cohesiveness, habitat, stress on clan structures, ethnicity bonds, higher position of women, and a strong sense of identity. The lack of global recognition as ‘Indigenous people’ acted as a boon in disguise to help Adivasis unite as a whole, upholding their values and laws. The absence of differentiation on the basis of social-class is a major learning. Maybe we can improvise on this system by uniting ourselves as a collective human race rather than fragmentation of people into various groups? Indian pharmaceutical industry is worth 27 billion dollars and is the third largest in the world, by volume. Increasing diseases have led to an increase in the advancement of medicines and technology to cure diseases. But these medicines contain chemicals and have harmful side-effects. The occurrence of side-effects is a big drawback in the health industry and masses are suffering from it. This is yet another field where Adivasis stand out with their use of ancestral plant-based medicine. Ethno-medicine is the belief and practice relating to health and diseases, which are products of indigenous cultural knowledge of the particular communities. The “Adis” of Siang, Arunachal Pradesh involve the use of herbs, plants and roots of some trees for healthcare. They have distinct ways of treating different diseases using a variety of herbal medicines. Their medicines are used to cure some common diseases such as fever, malaria, jaundice, etc. As per a report published in Science Direct, Natural Products Alert (NAPRALET) contains nearly 2500 species used in traditional medical systems in India alone. If we inculcate the use of this practice in our system of healthcare, minimizing the use of chemical-based medicines and choosing ethnomedicines can be a good alternative to the recurring diseases among masses. We know forests are sacred to Adivasis and they have a co-existential relationship with nature. They associate their existence with land. This is not only because agriculture is their primary profession, but also they think of nature as their “mother” i.e. a divine entity. The land is their pride. Nature is personified in different tribal literatures as different beings. They have emotions. They measure happiness of the self in terms of nature. For example, the Oraon tribes measure their happiness by cattle, crops, and children. 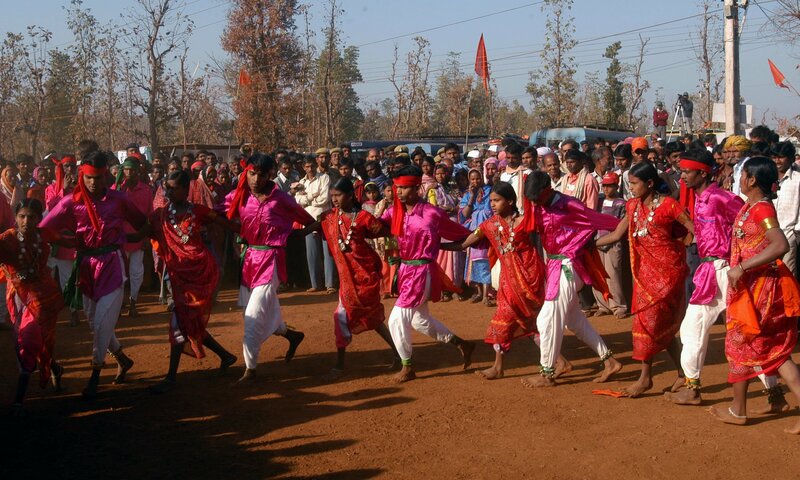 One example that depicts the devotion adivasis hold towards nature is that of the Gonds. They are the largest ethnic Adivasi community of India and add up to around 14 million people in total. Their principle god is the “Bada Dev” whom they consider as the creator of the universe. He is believed to control life and death. In Gond culture, god resides in the Saja tree and this is why it is most sacred to the community. They ensure complete protection of the tree and use it for ceremonial purposes. Associating nature with human emotions can help us develop a bond with them so that we start respecting nature and stop draining the environment of resources in the long run. Adivasi may be seen as a backward community today, but that is because the popular culture involves living in an unsustainable manner. Society looks down upon people who do not live a credit-based lifestyle, showcasing products of capitalism and living a life full of debt. 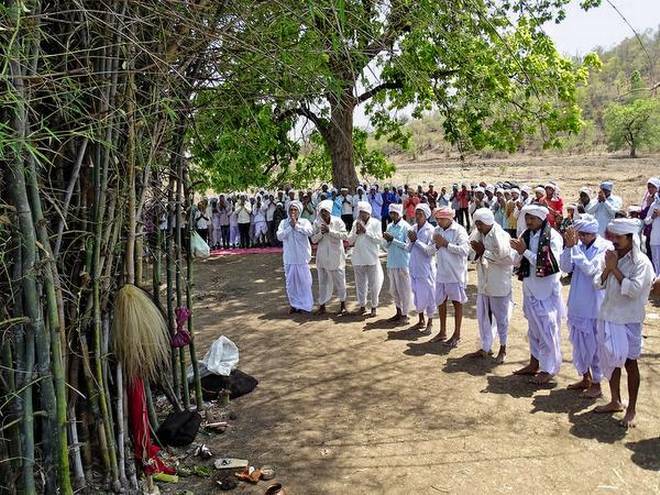 Adivasis show us a far nobler way of life, one that does not extract resources mindlessly, treats the community members with more respect, is rooted in ancestral plant-based knowledge and worships nature instead of decimating it. Aren’t these the virtues worth celebrating?